Released in 1988, the second game in the Wonder Boy series deviated greatly from the first. Instead of sticking to the prehistoric theme of the first game, Wonder Boy in Monster Land is set in a medieval fantasy land. The game introduced a primitive shop system where you could use your coins earned from enemies and random drops to buy items. Best time: 0:18:50 by Mathieu 'Mpatard' Patard on 2013-05-26. Best time, European version: 0:21:27 by Tom 'Konnan' van Mol on 2005-11-12. European version: 0:21:27 by Tom van Mol. First of all, thanks to Nate for capturing the run and Radix for uploading it. 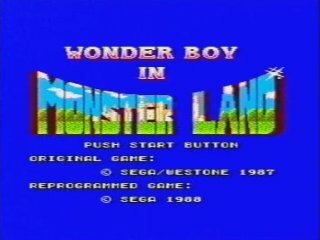 Wonderboy in Monsterland is a pretty tough game to speedrun. The game isn't that hard if you know it inside out and take your time to complete it, but it's pretty hard to do fast. I already found out things I could have done faster (I make plenty of tiny mistakes), but this run has such good elements in it, that I'm confident with it. 2 opponents drop a gauntlet at perfect locations, which makes you twice as strong for about a minute. I manage to lock the grizzly bear twice in the 2 occasions I battle him. I do take too much time to grab money though, and that's where I might save some time in a future run, if I'll ever do it. Have fun people! For any suggestions, questions, comments or new tricks (I'd love to hear of new routes and tricks), mail me at tumpke AT hotmail DOT com.